Akkana's Musings on Open Source Computing and Technology, Science, and Nature. I'm taking a MOOC that includes equations involving Greek letters like epsilon. I'm taking notes online, in Emacs, using the iimage mode tricks for taking MOOC class notes in emacs that I worked out a few years back. Iimage mode works fine for taking screenshots of the blackboard in the videos, but sometimes I'd prefer to just put the equations inline in my file. At first I was typing out things like E = epsilon * sigma * T^4 but that's silly, and of course the professor isn't spelling out the Greek letters like that when he writes the equations on the blackboard. There's got to be a way to type Greek letters on this US keyboard. Of course you can use xmodmap to define a key to be <dead_greek>. I stared at my keyboard for a bit, and decided that, considering how seldom I actually need to type Greek characters, I didn't see the point of losing a key for that purpose (though if you want to, here's a thread on how to map <dead_greek> with xmodmap). And now I can type [MENU] g e and a lovely ε appears, at least in any app that supports Greek fonts, which is most of them nowadays. 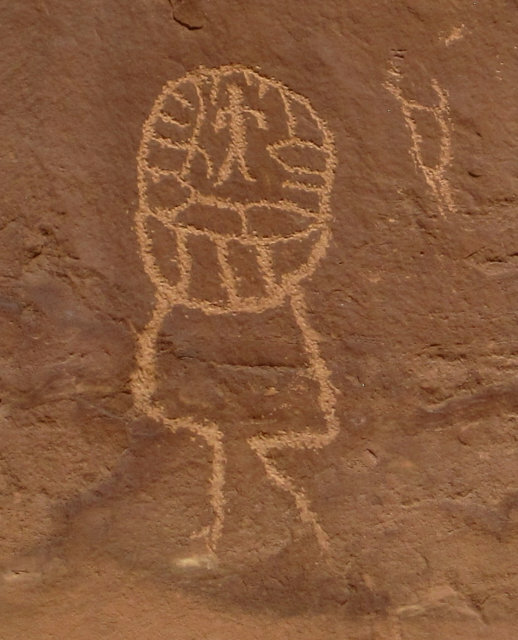 Last week, my hiking group had its annual trip, which this year was Bluff, Utah, near Comb Ridge and Cedar Mesa, an area particular known for its Anasazi ruins and petroglyphs. The photo at right is probably the most photogenic of the ruins I saw. It's in Mule Canyon, on Cedar Mesa, and it's called "House on Fire" because of the colors in the rock when the light is right. The light was not right when we encountered it, in late morning around 10 am; but fortunately, we were doing an out-and-back hike. Someone in our group had said that the best light came when sunlight reflected off the red rock below the ruin up onto the rock above it, an effect I've seen in other places, most notably Bryce Canyon, where the hoodoos look positively radiant when seen backlit, because that's when the most reflected light adds to the reds and oranges in the rock. Sure enough, when we got back to House on Fire at 1:30 pm, the light was much better. It wasn't completely obvious to the eye, but comparing the photos afterward, the difference is impressive: Changing light on House on Fire Ruin. The weather was almost perfect for our trip, except for one overly hot afternoon on Wednesday. And the hikes were fairly perfect, too -- fantastic ruins you can see up close, huge petroglyph panels with hundreds of different creatures and patterns (and some that could only have been science fiction, like brain-man at left), sweeping views of canyons and slickrock, and the geology of Comb Ridge and the Monument Upwarp. 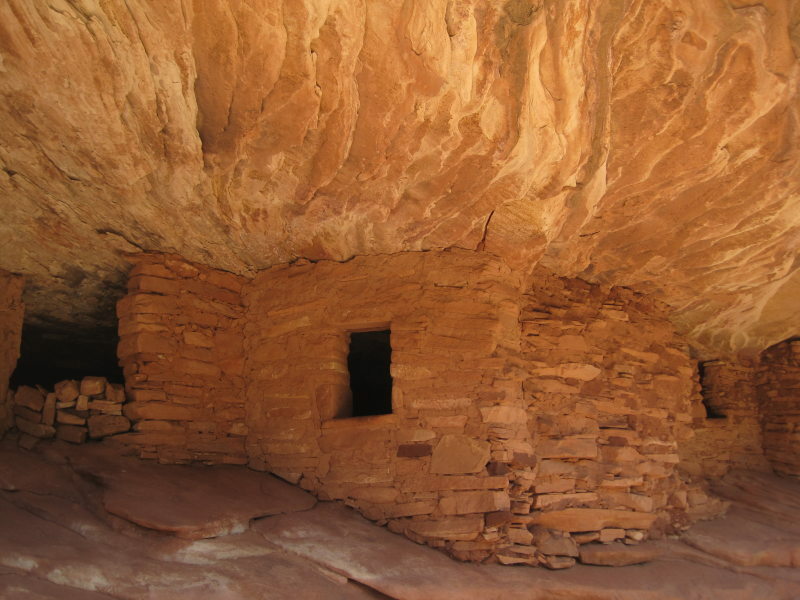 And in case you read my last article, on translucent windows, and are wondering how those generated waypoints worked: they were terrific, and in some cases made the difference between finding a ruin and wandering lost on the slickrock. I wish I'd had that years ago. It happened again: someone sent me a JPEG file with an image of a topo map, with a hiking trail and interesting stopping points drawn on it. Better than nothing. But what I really want on a hike is GPX waypoints that I can load into OsmAnd, so I can see whether I'm still on the trail and how to get to each point from where I am now. My PyTopo program lets you view the coordinates of any point, so you can make a waypoint from that. But for adding lots of waypoints, that's too much work, so I added an "Add Waypoint" context menu item -- that was easy, took maybe twenty minutes. PyTopo already had the ability to save its existing tracks and waypoints as a GPX file, so no problem there. But how do you locate the waypoints you want? You can do it the hard way: show the JPEG in one window, PyTopo in the other, and do the "let's see the road bends left then right, and the point is off to the northwest just above the right bend and about two and a half times as far away as the distance through both road bends". Ugh. It takes forever and it's terribly inaccurate. More than once, I've wished for a way to put up a translucent image overlay that would let me click through it. So I could see the image, line it up with the map in PyTopo (resizing as needed), then click exactly where I wanted waypoints. I needed two features beyond what normal image viewers offer: translucency, and the ability to pass mouse clicks through to the window underneath. The -c specifies client-side compositing. -t and -l specify top and left offsets for window shadows (negative so they go on the bottom right). -o.1 sets the opacity of window shadows. In the long run, -o0 is probably best (no shadows at all) since the shadow interferes a bit with seeing the window under the translucent one. But having a subtle .1 shadow was useful while I was debugging. That's all I needed: voilà, translucent windows. Now on to the (much) harder part. X11 has something called the SHAPE extension, which I experimented with once before to make a silly program called moonroot. It's also used for the familiar "xeyes" program. It's used to make windows that aren't square, by passing a shape mask telling X what shape you want your window to be. In theory, I knew I could do something like make a mask where every other pixel was transparent, which would simulate a translucent image, and I'd at least be able to pass clicks through on half the pixels. But fortunately, first I asked the estimable Openbox guru Mikael Magnusson, who tipped me off that the SHAPE extension also allows for an "input shape" that does exactly what I wanted: lets you catch events on only part of the window and pass them through on the rest, regardless of which parts of the window are visible. Knowing that was great. Making it work was another matter. Input shapes turn out to be something hardly anyone uses, and there's very little documentation. In both C and Python, I struggled with drawing onto a pixmap and using it to set the input shape. Finally I realized that there's a call to set the input shape from an X region. It's much easier to build a region out of rectangles than to draw onto a pixmap. * size of the window. The rest will be transparent. /* Make a frame region. * So in the outer frame, we get input, but inside it, it passes through. CreateFrameRegion() is similar but a little longer. Rather than post it all here, I've created a GIST: transregion.c, demonstrating X11 shaped input. Next problem: once I had shaped input working, I could no longer move or resize the window, because the window manager passed events through the window's titlebar and decorations as well as through the rest of the window. That's why you'll see that CreateFrameRegion call in the gist: -- I had a theory that if I omitted the outer part of the window from the input shape, and handled input normally around the outside, maybe that would extend to the window manager decorations. But the problem turned out to be a minor Openbox bug, which Mikael quickly tracked down (in openbox/frame.c, in the XShapeCombineRectangles call on line 321, change ShapeBounding to kind). Openbox developers are the greatest! Okay, now I had a proof of concept: X input shapes definitely can work, at least in C. How about in Python? There's a set of python-xlib bindings, and they even supports the SHAPE extension, but they have no documentation and didn't seem to include input shapes. I filed a GitHub issue and traded a few notes with the maintainer of the project. It turned out the newest version of python-xlib had been completely rewritten, and supposedly does support input shapes. But the API is completely different from the C API, and after wasting about half a day tweaking the demo program trying to reverse engineer it, I gave up. My transimageviewer.py came out nice and simple, inheriting from imageviewer.py and adding only translucency and the input shape. The translucent image viewer worked just as I'd hoped. 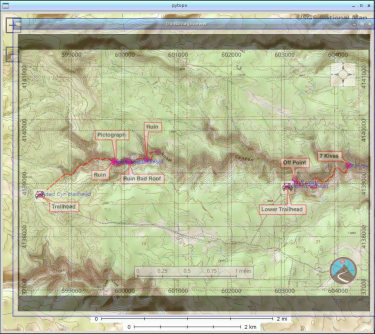 I was able to take a JPG of a trailmap, overlay it on top of a PyTopo window, scale the JPG using the normal Openbox window manager handles, then right-click on top of trail markers to set waypoints. When I was done, a "Save as GPX" in PyTopo and I had a file ready to take with me on my phone.